One of the ingredients we have in our CV Skinlabs products is sea buckthorn oil. What’s that, you may ask? We’re happy to tell you! Sea buckthorn oil comes from the seeds and fruit of the sea buckthorn shrub, which is often found on the seacoasts where the salt spray from the ocean prevents other plants from competing with it. It’s also widespread in many other areas, including northwestern China, Western Europe, and central Asia. 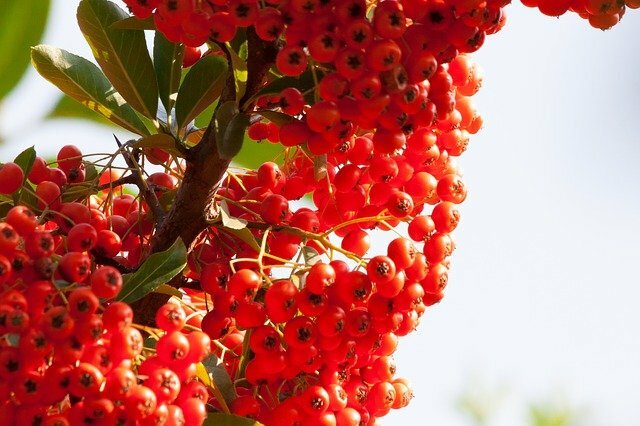 The botanical name for the plant, Hippophae rhamnoides, translates to “tree that makes the horse shine.” Historically, people found that it helped improve horses’ health while making their hair and tails shiny and smooth. The shrub can grow up to 19 feet tall, with stiff and thorny branches and pale, silvery-green leaves. It is frequently used to create windbreaks and to stabilize riverbanks and steep slopes. The male plant produces brownish flowers, and the female produces orange, edible berries. Because the berries are sour, they’re often treated to reduce astringency, and then mixed in drinks, pies, jams, teas, wines, and liquors. Traditionally, people use the bark and leaves of the plant to treat diarrhea and skin disorders, and used the berry oil as a skin softener. The oil is naturally high in essential fatty acids, which are natural skin moisturizers, as well as in vitamin E and beta-carotene. It’s also a good source of vitamin C, with higher levels even than an orange. One of the really exciting components of this oil is “superoxide dismutase (SOD),” a powerful antioxidant that is believed to be more powerful even than ginseng and other antioxidants when it comes to fighting free radical damage. With all these wonderful components and more, sea buckthorn can create miracles on the skin. 1. Tames inflammation and helps soothe various skin conditions. Inflammation is at the heart of many skin problems, including eczema, psoriasis, rosacea, and even acne. If we can tame that inflammation, we can help reduce outbreaks and keep skin looking calm and smooth. Studies have found that topical application of sea buckthorn helps reduce inflammation. In one study, it was particularly effective against eczema, bringing relief from itching, inflammation, and dryness. Scientists believe that various components in sea buckthorn give it this power-the antioxidant beta-carotene, omega-3 fatty acids, and vitamins C and E.
3. Fights bacteria (great for acne sufferers). As mentioned above, sea buckthorn oil has a natural anti-bacterial property, and it has been recommended for acne sufferers for this reason. The action is so powerful that researchers discovered it could actually kill methicillin-resistant staphylococcus aureus (MRSA)-at levels comparable with the antibiotic vancoycin. 4. Replenishes essential fatty acids. Essential fatty acids (EFAs) help minimize the appearance of aging, and they also help moisturize while controlling excess oil-perfect for acne-prone skin as well as other skin types. As we age, our ability to retain moisture in the skin goes down, but additional EFAs can help change that. Sea buckthorn is an abundant source of skin-healthy EFAs, and is great for taking care of dry, flaky, and aging skin. One of its most moisturizing EFAs is omega-7, which is actually a natural component of skin. Use this natural oil to fade fine lines and wrinkles and revive skin. 5. Regenerates skin for a healthier complexion. Another one of sea buckthorn’s talents is its ability to speed up cell turnover so that skin appears younger-looking. It’s a good source of vitamin A, which encourages regeneration of skin tissues, creating a smoother, healthier complexion. The skin is constantly shedding old cells and bringing new ones to the surface, but this process slows as we age. Sea buckthorn oil stimulates skin healing and regeneration to help delay the appearance of dullness and aging. Sea buckthorn oil has a lot of antioxidants in it, and they all help fight free radical damage that accelerates aging. In addition to protecting the skin from UV rays, it also fights damage from pollution, smoke, poor diet, stress, and more. The high levels of SUD make this oil particularly powerful when it comes to fighting the elements that cause aging. You also get vitamin C and E, which are both antioxidants, as well as beta-carotene and free-radical fighting flavonoids. 7. Helps lighten age spots and hyperpigmentation. Sea buckthorn contains vitamin C, which helps lighten hyperpigmentation, and also contains antioxidant “gallocatechins,” which are effective against excess melanin in the skin. In a 2013 study on people with melasma (mask-like hyperpigmentation), researchers found that sea buckthorn extract helped decrease levels of melanin and helped fade the dark areas on the skin. We can summarize by saying that sea buckthorn oil is an anti-aging miracle for skin! It not only helps reduce acne breakouts, it tames inflammatory skin conditions, moisturizes without being oily or greasy, protects from free-radical damage, smoothes fine lines and wrinkles, fades hyperpigmentation, and helps encourage skin regeneration. We think you’ll agree-this was a great ingredient to include in our Restorative Skin Balm! Have you used sea buckthorn oil for your skin? Sources“Sea buckthorn helps relieve inflammatory skin conditions,” NaturalHealth365, December 24, 2013, http://www.naturalhealth365.com/sea_buckthorn.html/.Edraki M, et al., “Healing effect of sea buckthorn, olive oil, and their mixture on full-thickness burn wounds,” Adv Skin Wound Care, July 2014; 27(7):317-23, https://www.ncbi.nlm.nih.gov/pubmed/24932952.Qadir Ml, et al., “Report-Antibacterial activity of sea buckthorn (Hippophae rhamnoides L.), against methicillin resistant Staphylococcus aureus (MRSA),” Pak J Pharm Sci., September 2016; 29(5):1711-1713, https://www.ncbi.nlm.nih.gov/pubmed/27731833.Barkat Ali Khan, et al., “Whitening efficacy of plant extracts including Hippophae rhamnoides and Cassia fistula extracts on the skin of Asian patients with melasma,” Postepy Dermatol Alergol., August 2013; 30(4):226-232, https://www.ncbi.nlm.nih.gov/pmc/articles/PMC3834707/. 5 Morning Skin Care Mistakes that Age You!